The lobster fishery is very important to Tristan, being the main source of income that supports the island community. The exceptional quality of the Tristan Lobster (Jasus tristani) means it is now on the menu of some of the finest restaurants in the world and used by many of the world’s leading supermarkets. 1) Vessel-based: Operated by concession and using large ocean-going fishing vessels from Cape Town they fish around the three outer islands of Inaccessible, Nightingale and Gough Island. Catches are processed and frozen on-board the fishing vessels. 2) Island-based: Operated entirely by island fishermen and is restricted to Tristan da Cunha Island, using twelve 7-8m power-boats that deliver catches to the factory, on the island, for processing. 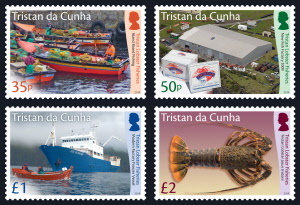 Commercial fishing at Tristan da Cunha for the rock lobster (Jasus tristani), known locally as crawfish, started in 1949. This was the result of “The Tristan Venture” an exploratory expedition held in 1948. The South Atlantic Islands Development Corporation (SAIDC) was then formed and granted sole rights to export lobster. In 1949, construction started on a canning plant on Tristan, which was operational by the end of 1950. From 1949 to 1961 all fishing was done in dinghies launched from the shore. Fishing of lobster was restricted to near the settlement until the mid-1950’s when a motorboat was purchased to tow the dinghies around the island. In 1960, the canning factory closed and extra freezing capacity was installed. In October 1961, the lava flow from a volcanic eruption destroyed the factory and the whole island was evacuated to the UK. The islanders returned in 1963 and rebuilt the factory in a different location. This was opened on 23rd May 1966. From 1965 larger motorboats gradually replaced the local fleet of dinghies. Size limits were introduced in the 1980s but a continuing decline in catches led to the introduction of Total Allowable Catches (TAC’s) in 1991 and the Fisheries Department now recommends a TAC to the Island Council on an annual basis with Council approving the set TAC for the season. The Fisheries Department is responsible for the collection of fishing and catch information, issuing fishing licenses and ensuring the factory and fishing operations perform to the highest standard. A new concession was granted to Ovenstone Agencies in 1997, including a set of regulations to govern the fishery. A major change in the fishery followed when restrictions on gear and boats, TAC’s, a ban on taking egg-bearing females and seasonal closures were enforced. On 13th February 2008 the current fish factory caught fire and burnt to the ground. It was rebuilt to EU specifications and was officially reopened on 17th July 2009. The Marine Stewardship Council (MSC) certified the fishery for J. tristani in 2011, implying that it had passed a stringent assessment of stock status, management efficiency and environmental impact. After many years, the Tristan Lobster fishery finally received approval to import into the EU in 2014, a major achievement. Due to the remote location of the fishery, the lobsters are only available in a range of premium frozen formats, including whole cooked, whole raw, tails and a unique format the “sashimi grade” whole lobster. The most important management measure for the Tristan Fishery has been the imposition of TACs for each island, introduced in 1991. The improvements in sustainability of the fishery have brought with it a period of economic stability for Tristan da Cunha. Continuing the fishery in a sustainable and precautionary approach is a primary goal for Tristan da Cunha to both serve as a secure form of income for the Island and minimise the potential environmental impact of the fishery.